One day, there will be a camera in every object you see. In essence, each object you look at will be looking back at you. 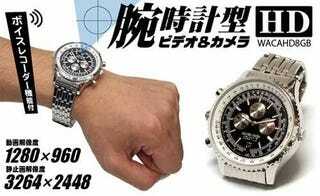 Until then, we just have this bulky HD watch. The JTT WACAHD8GB is a somewhat ordinary timepiece that, when not telling the time, is shooting 1280x960 video at 30fps, or grabbing stills at 8MP.